As you may expect from this affordable little amp, the controls are pretty simple – which is an advantage for beginners in particular. Set on the front of the amp, these controls comprise a gain rotary control along with a push-button channel select switch, allowing you to instantly add overdrive to your tone. Next comes the volume control along with bass and treble, before the power switch at the far right. Basic, but this amp offers everything a guitarist really needs. For under one hundred bucks, there’s plenty on offer with the Frontman 10G. Designed to fit nicely into the Frontman collection, it feels sturdy and reliable, sporting a durable black case with a small carrying handle, a silver grille cloth and the classic Fender logo on the face. Under this sits a 6” Special Design speaker offering 10 watts of power. On the control panel are two 1/8” inputs, allowing you to plug in both an external media player and play along to your favorite tracks, as well as headphones to enjoy silent late-night practice sessions. The 10 watts of power isn’t likely to blow anyone away – and it certainly isn’t worthy of more than casual performance – but that’s why it’s such a good practice amp. Besides, turning it up full blast in a house is still likely to draw some disapproval from the neighbours. The tone on offer is great for such a measly price. The cleans are exactly what you’d expect from a Fender amp, while the gain control allows for bluesy crunch right up to heavy overdrive for modern rock. It’s not the beefiest distortion, but it’s a great tool for practice. There’s plenty going on for the Fender Frontman 10G and you just have to spend five minutes with it to see why it’s so respected. While many players will outgrow the power on offer, even the most seasoned players will enjoy hanging onto it for quick plug n’ play sessions. For such a little asking price, there’s seriously good value on offer. 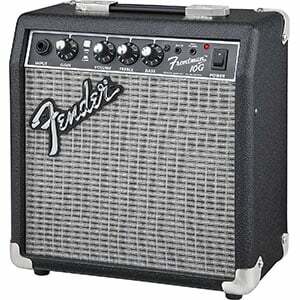 For more info about the Fender Frontman 10G, click here. 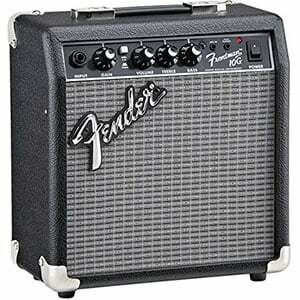 For more Practice Guitar Amplifiers you might like, click here.